Cleopatra did it..... Ancient goddesses did it..... Even Marilyn Monroe did it. Did what? ….. 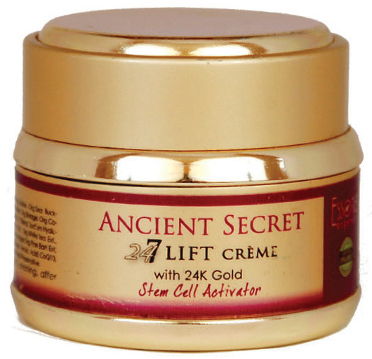 Ancient Secret has successfully blended this wisdom of the ages with the latest stem cell technology, powdered gold and a unique delivery system to make you look 10-15 years younger in days, not weeks or months. Skin stem cells lie dormant until they receive signals from the body to begin the repair mode. Ancient Secret uses a “skin cell activator” to awaken your skin’s stem cells so they immediately begin to generate many new skin cells, thereby repairing and filling in fine lines and wrinkles to restore and maintain your skin’s firmness and elasticity. This luxurious formula is made to lift, smooth and hydrate while providing antioxidant protection from free radical damage. Your skin will radiate its full, natural beauty after drinking in this amazing blend of organic oils, natural herbs and soothing botanicals. Infused with high quality marine collagen to plump your skin to fill in fine lines and wrinkles for firmer and smoother appearance. Ancient Secret gives your skin the incredible power to rejuvenate and restore your youthful look, naturally. Discover the “Secret of the Ages”. • Powerful regenerative and anti-aging action. • Brings back your youthfull skin elasticity. • Activates sleeping stem cells for new growth. • Stimulates protein synthesis and enzymatic activity. • Improvrs skin elasticity and hydration. • Natural anti-wrinkle and anti-aging effect. • Provides energy boost to your skin. • Anti-inflammatory agents fight the effects of aging. • Helps to balance oil gland production. • Anti-inflammatory properties calm your skin. • Reduces scar tissue, hyper-pigmentation and wrinkles. • Nourish, moisturize and reduce stretch marks and wrinkles. regenerates your skin’s youthful appearance. • Enhances your skin’s ability to retain moisture. • Immediate action to plump and fill fine lines. • Skin immediately looks smoother, more youthful and alive. • Lightens and brightens your skin. • Reduces the appearance of age spots. • Evens your skin tone. • Illuminating and glowing effect. • Natural face lift effect. Gold is probably the most popular and most sought-after metals in the whole world. It is valued because of its appearance and rarity. Throughout history, it has been used to symbolize wealth, power and high status. Very few people know though that it has also been used to treat a wide range of skin problems especially in the olden times in places such as Rome, Japan and Egypt. Legend has it that Cleopatra – known for her legendary beauty - wore a gold mask every night in order to preserve her youthful looking skin. Indeed, gold is good to the skin. Other metals have been known to cause skin allergies but not gold. In fact, there are people with sensitive skin who can only wear gold jewelry and nothing else. This group of flowering shrubs belong to the Old Rose family, archaic bloodlines from the Middle and Far East which were used in the development of more modern varieties of garden rose in 18th and 19th Centuries in Europe. ? ?The history of this rose is a long one, it has been recognized and cultivated as a symbol of beauty and vigor since biblical times. In the 11th century an Iranian doctor called Avicenna is credited as having discovered the method extracting rose water from the petals sometime in the 11th century. ? ?Legend says that these roses were first introduced to Europe by a Crusader named Robert de Brie sometime during the late 13th century. Others claim that the rose was introduced to England by the Romans. A third origin claims that they were introduced to King Henry VIII by his physician in the 1540s . The Damask Rose remains popular today. It is still favored for it’s vibrancy, luxurious odor and pleasant flavor. Perhaps most importantly, however, is the continued use of the Damask Rose for it’s medicinal and spiritual effects, a time honored tradition that is only now being validated by science. Rose Otto, Rose Absolute, and Rose Water--What’s the Difference? Rose Otto is the essential oil that is the end result of steam distillation of the R. damascena bloom. Steam distillation works by bubbling steam through plant material to separate it’s water soluble and fat soluble components. It is a highly concentrated substance and production requires a vast quantity of rose petals. A single drop of pure rose essential oil requires 60 roses, this is why Rose Otto is so expensive . Rosa damascena has been studied extensively, both because of it’s history, and because of it’s profound effects on multiple systems of the body. Scientific studies have observed hypnotic, analgesic, anticonvulsant, antitussive, bronchodilatory, anti-HIV, antibacterial, anti-diabetic, antioxidant, antimicrobial, laxative, prokinetic, and anti-inflammatory effects, all resulting from treatment with various R. damascena solutions, and these are only the effects that have been scientifically validated . The Damask Rose is a remarkable gift to mankind. For centuries it has delighted us with it’s many culinary, fragrance and aesthetic uses. For just as long is has been giving us an even more powerful gift than it’s beauty, a remarkable and unprecedented healing ability that remains, to this day, unmatched in it’s broad spectrum and potent efficacy. For years, herbalists have been harnessing the abilities of this gentle and fragile bloom, a blossom so highly regarded that it’s popularity is only matched by it’s scarcity. Perhaps, more than anything, that speaks to the nature of this unique rose, good things come in tiny packages. Jasmine, the flower, also known as, “Queen of the Night” is a well known flower from the Himalayas and Asia. It is a beautiful white six petal flower surrounded by green leaves. It comes from the Oleaceae botanical family. Its amazing scent is often used in body washes, perfumes, soaps, air fresheners, cosmetics and laundry detergent. The jasmine flower only blooms and releases is scent at night. According to legend, a princess fell in love with the sun god Surya-Deva. Surya-Deva rejected the princess’ affections and she killed herself. Her remains were scattered on the ground and from her ashes grew the jasmine flower. The belief is the flower only blooms and releases its scent into the night's sky because of the Surya-Deva part in the princess’ death. This is considered to be his punishment. Insomnia is a horrible affliction. It can promote many illnesses. We all need our rest and a good night's sleep is crucial to our overall health. Jasmine oil can be used to obtain an undisturbed good night’s sleep. The essential properties of this oil as a sedative, expectorant and antispasmodic help you not only fall asleep, but stay asleep. Our sleep habits affect our mood, productivity and patience. Gaining good sleep habits will make you a much happier and more productive person.